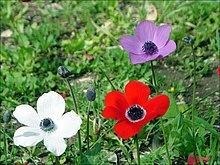 Type species: Anemone coronaria L.
Anamenia Vent., Jard. Malm. ad t. 22. 1803. Type species: A. coriacea Vent., nom. inval. Anemanthus Fourr., Ann. Soc. Linn. Lyon sér. 2, 16: 323. 1868. Anemoclema (Franch.) W.T.Wang, Acta Phytotax. Sin. 9: 105. 1964. Type species: A. glaucifolia Franch. Anemonanthea S.F.Gray, Nat. Arr. Brit. Pl. 2: 724. 1821. Anemonastrum Holub, Folia Geobot. Phytotax. (Praha), 8, 2: 158. 1973. Anemonidium (Spach) Holub, Folia Geobot. Phytotax. 9(3): 272. 1974. Anemonidium (Spach) Á.Löve & D.Löve, Taxon 31(1): 124. 1982, comb. superfl. Anemonoides Mill., Gard. Dict. Abr. ed. 4. 28 Jan 1754. Anetilla Galushko, Fl. Severnogo Kavkaza 278. 1978, nom. inval. Arsenjevia Starod., Bot. Zurn. (Moscow & Leningrad) 74: 1344. 1989. Christophoriana Kuntze, Rev. Gen. 1: 1. 1891, Mill. (1754). Hepatica Mill., Gard. Dict. Abr. ed. 4.. 28 Jan 1754. Type species: H. nobilis Schreb. Jurtsevia Á.Löve & D.Löve, Bot. Not. no. 128: 511. 1976, nom. inval. Knowltonia Salisb., Prodr. Stirp. Chap. Allerton 372. 1796. Type species: K. rigida Salisb., nom. illeg. Pulsatilla Mill., Gard. Dict. Abr., ed. 4. [unpaged]. 1754. Type species: P. vulgaris Mill. Note: This is a view of Anemone s.l. see Hassler (2018) for s.s., but recent evidence supports a narrower circumscription of this genus compared to Hoot et al. (2012). Linnaeus, C. 1753. Species Plantarum 1: 538. Hassler, M. 2018. Anemone. World Plants: Synonymic Checklists of the Vascular Plants of the World (version Mar. 2018). In: Roskov Y., Abucay L., Orrell T., Nicolson D., Bailly N., Kirk P., Bourgoin T., DeWalt R.E., Decock W., De Wever A., Nieukerken E. van, Zarucchi J., Penev L., eds. 2018. Species 2000 & ITIS Catalogue of Life. Published on the internet. Accessed: 2018 Oct. 11. Hoot, S.B., Meyer, K.M. & Manning, J.C. 2012. Phylogeny and Reclassification of Anemone (Ranunculaceae), with an Emphasis on Austral Species. Systematic Botany 37(1): 139–152. doi: 10.1600/036364412X616729 PDF Reference page. International Plant Names Index. 2018. Anemone. Published online. Accessed Oct. 11 2018. Jiang, N., Zhou, Z., Guan, K.Y. & Yu, W.B. 2015. Nomenclatural transfer of Chinese Pulsatilla to Anemone (Ranunculaceae). Nordic Journal of Botany 33(4): 469–471. doi: 10.1111/njb.00700 Full text PDF from ResearchGate Reference page. Meyer, K.M., Hoot, S.B. & Arroyo, M.T. 2010. Phylogenetic affinities of South American Anemone (Ranunculaceae), including the endemic segregate genera, Barneoudia and Oreithales. International Journal of Plant Sciences 171(3): 323–331. doi: 10.1086/650153 Full text PDF Reference page. For more multimedia, look at Anemone on Wikimedia Commons.